My first item is ready to be sent to Loving Hands and here he is. 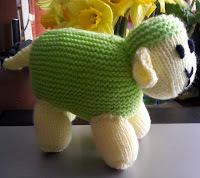 A lovely little sheep all ready for Spring in green and yellow. He was fun to make and easy to knit so a win win as far as I am concerned. 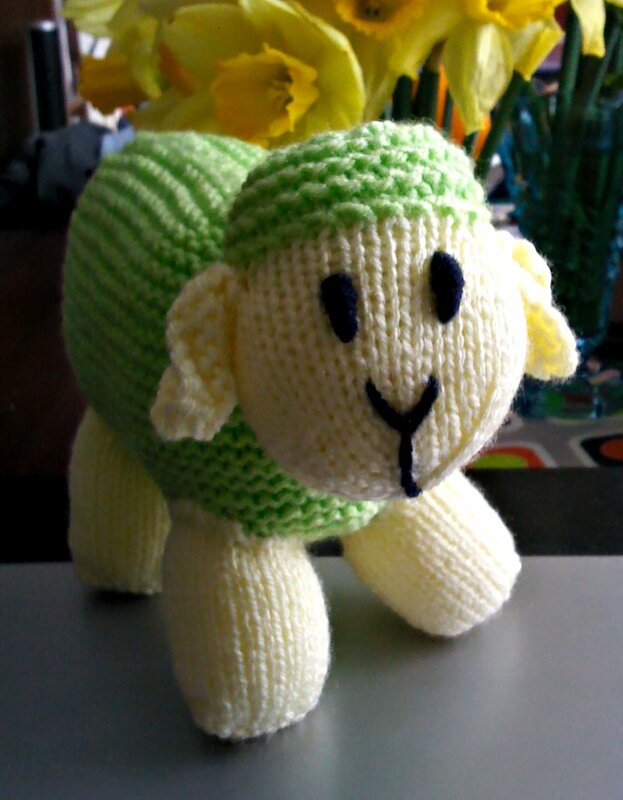 I like easy patterns as I am not great at following fiddly ones so if I can make him anyone can. Here is the link if you want to make him Cynthia's Sheep. I added the eyes and face before I sewed up the top part of the head after stuffing it first. That way the threads are inside the head and cannot be seen, they are also caught in the stuffing making it harder for any threads to be pulled out.. The long stitch for the mouth I did in back stitch so little fingers will not be able to pull at it. He will be posted off Friday 5th April 2013. Thank you I kind of like him myself and hope that he will chosen by someone to love.